British television continues to surprise, and this time it’s not the BBC but ITV: the Guardian revealed that Rowan Atkinson will be taking over the iconic role of Jules Maigret in two feature-length movies. 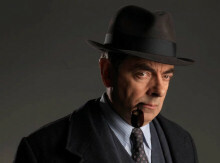 The first one, titled Maigret sets a Trap, will be aired on March 27, Easter Sunday, at 8pm GMT on ITV1. But can Atkinson, to many viewers primarily known as the bumbling Mr. Bean, pull this off? I believe so, because he is actually a terrific character actor, which you can see in Blackadder or even Johnny English, where he is much less a clown but more serious most of the time. There may be a bit of subtle comedy infused into this new incarnation of the french detective, but I’m confident that this could be Rowan Atkinson’s finest hour. Viewers expecting an Inspector Clouseau clone should probably stay clear of this adaptation, but as the Guardian article remarks, this could fill the gap that David Suchet’s retirement as Hercule Poirot, also an ITV production, has left. More good news also comes from the BBC: Planet Earth 2 has been announced, to be aired later this year and it will again be presented by David Attenborough, who will also be honoured by an hour-long interview programme for his 90th birthday on May 8th. There is also an interesting remark in this article about Attenborough making a documentary about luminescent lifeforms called Light on Earth for BBC2 which will also air this year.